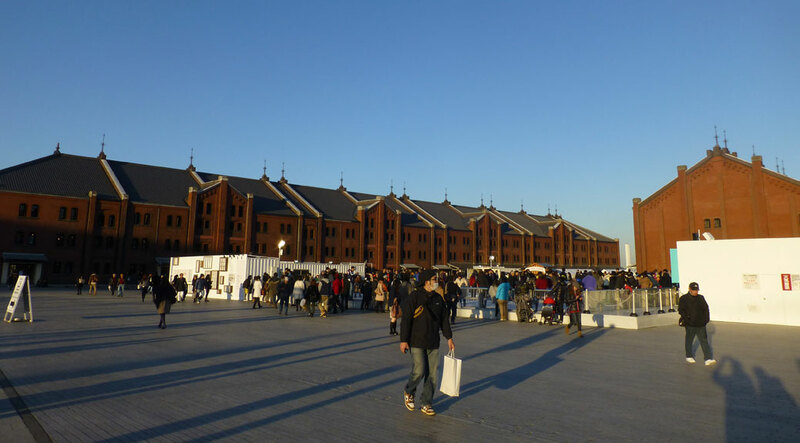 Yokohama was high on my list of places I wanted to visit while in Japan. I really knew nothing about it and the desire was probably due to it being home to the Yokohama Baystars baseball team, Japan’s equivalent to the Chicago Cubs (think “lovable losers”). 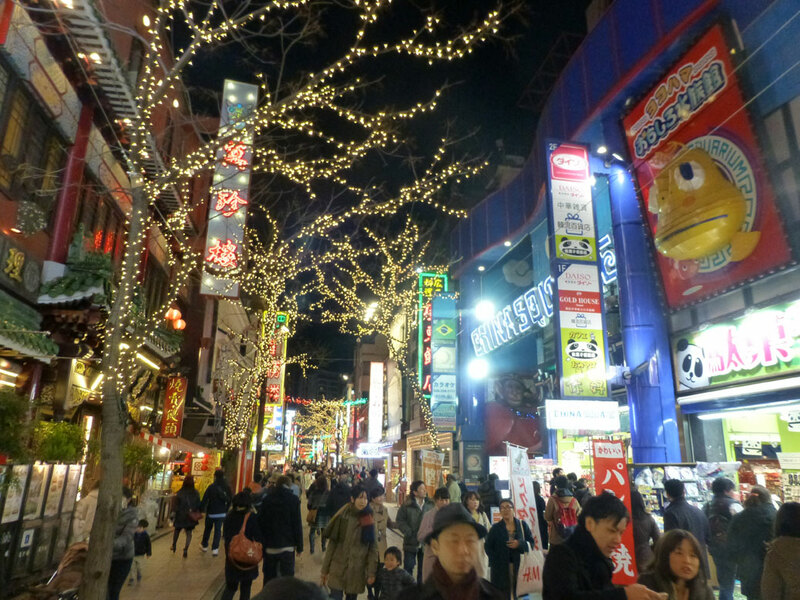 Last weekend, we popped down to Yokohama for the day. Located a short train ride south of Tokyo, it’s actually the most populated municipality in Japan and second most populated city after Tokyo. 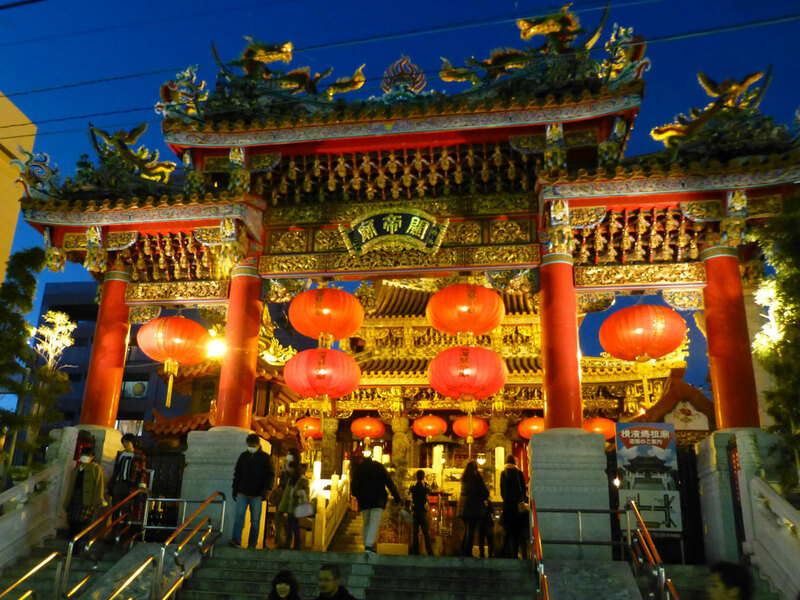 Due to its development as a port town in the 1800s, Yokohama is a melting pot of Pacific cultures. 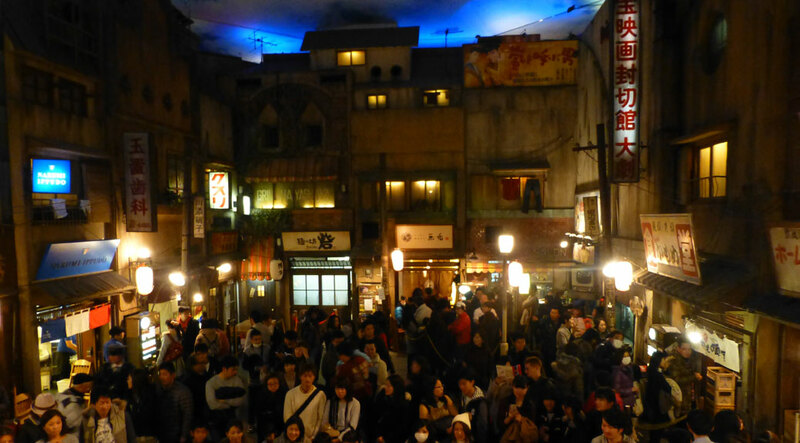 Our first stop was the Shin-Yokohama Raumen Museum, billed as the world’s first food-themed amusement park. On the two lower levels, a 1950s-era Japanese street scene has been replicated in authentic detail with signage, music and a variety of ramen shops. A less-era-authentic magician performed tricks for the large crowd while blasting modern electronic music from his iPhone. 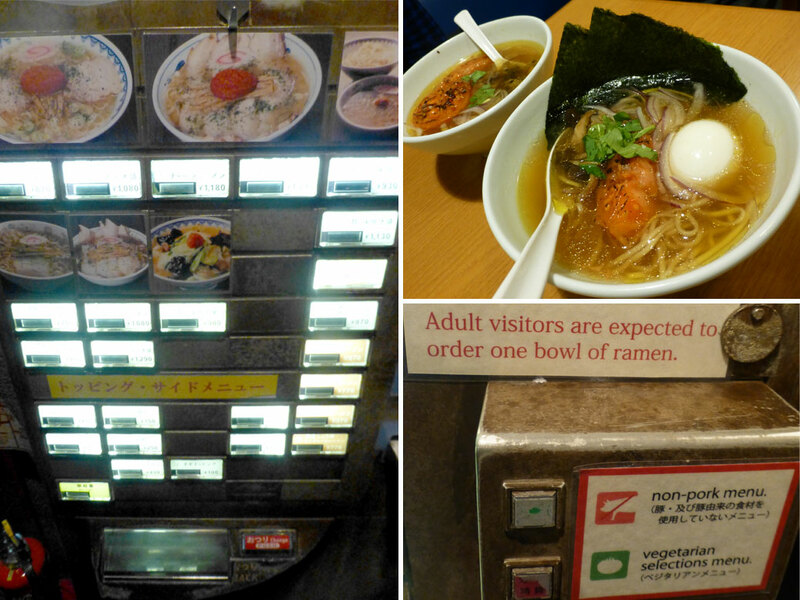 The standard ordering vending machine, still in use in many shops today; Vegetarian ramen at NARUMI-IPPUDO; The requirement: Everyone has to order at least one bowl of ramen on the honor system. The wait times for each shop are on a chalkboard by the main stairs. We arrived around noon and already some of the shops had 30 minute waits. Waiting that long for ramen in Japan seems a little silly since there are literally 20,000 shops in Tokyo with no wait, but it’s a little like waiting in line at Voodoo Doughnuts in Portland. The wait is part of the experience. We picked NARUMI-IPPUDO, a French bouillon/Japanese dashi hybrid for our first course. The mini-sized bowls with medium-sized noodles and light broth were the perfect appetizer. In response to the variety of tourists who come through the museum’s doors, most of the shops offer at least one vegetarian bowl and one halal option for the increasing number of Muslim visitors. Guilt-free ramen is the best ramen of all! Lunch #2 involved one of the aforementioned 30 minute waits. Ryu Shanghai offered a unique spicy ramen with thick noodles in a rich, flavorful soup. The added dollop of the spicy miso sauce on top was enough to open up the sinuses on a cold day. Kamome Shokudo was one shop caught my attention in the brochure. The original shop washed away in the 2011 earthquake and tsumani that decimated northeastern Japan. 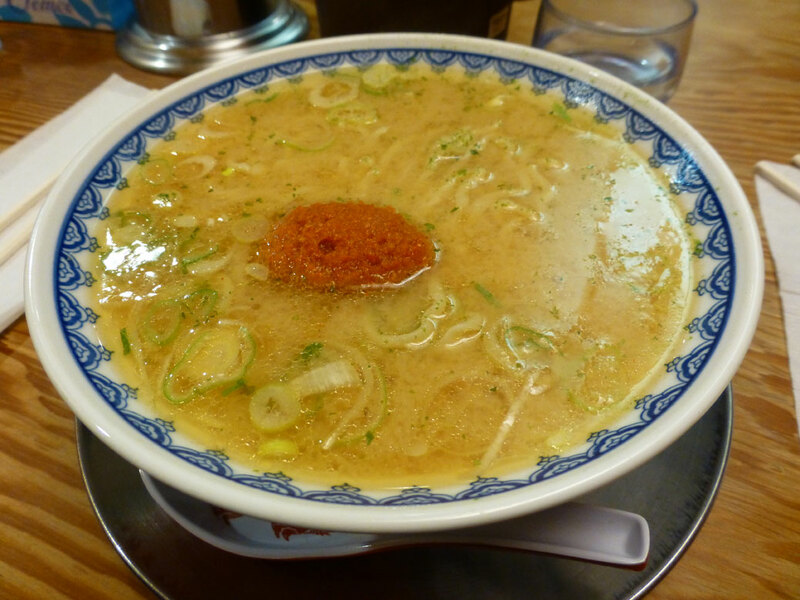 The shop has been replicated in the museum, giving their Sendai-style ramen a second life. Era-correct props dotted the museum’s basement floors. A payphone booth was made even more authentic by the black electrical tape holding the cord to the handset. 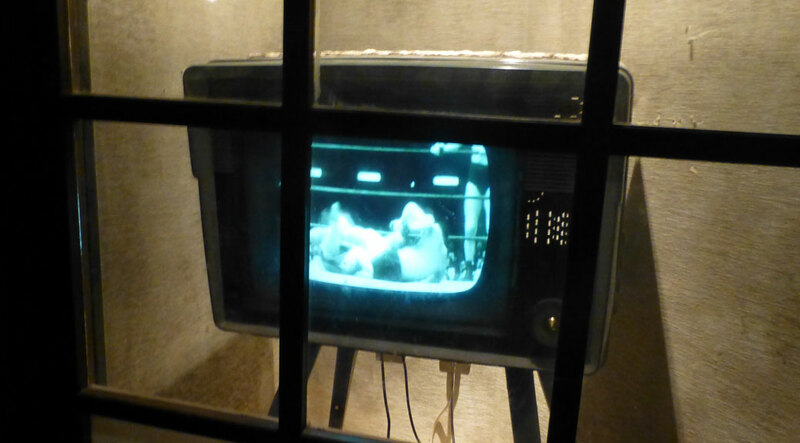 An old black and white television console showed 1950s professional wrestling matches (side note: the sport’s popularity in the 1950s used to draw large crowds to watch the matches on big screens in Tokyo). A stained vending machine rolled out small glass bottles of Coca Cola. Plenty to see while waiting in those long ramen lines. Yokohama Landmark Tower; Cosmo Clock 21 ferris wheel; Yokohama Bay Bridge. Next, we headed south toward Tokyo Bay. Every once in awhile, we get those “doesn’t feel like Japan” moments. The area around Tokyo Bay certainly qualified as one of those times. The massive Landmark Tower, Japan’s second largest building, anchors the skyline and casts a large shadow over the Nippon Maru, a clipper-style boat-turned-museum that was used as a training vessel for the Japanese Merchant Marines from the 1930s to the 1980s. Looking toward the bay, you can’t miss the Cosmo Clock 21, the centerpiece of the Minato Mirai 21 (MM21) shopping center. Built in 1989, it was the world’s tallest ferris wheel for nearly a decade and, thanks to the digital clock on its face, it still stands as the world’s largest timepiece. 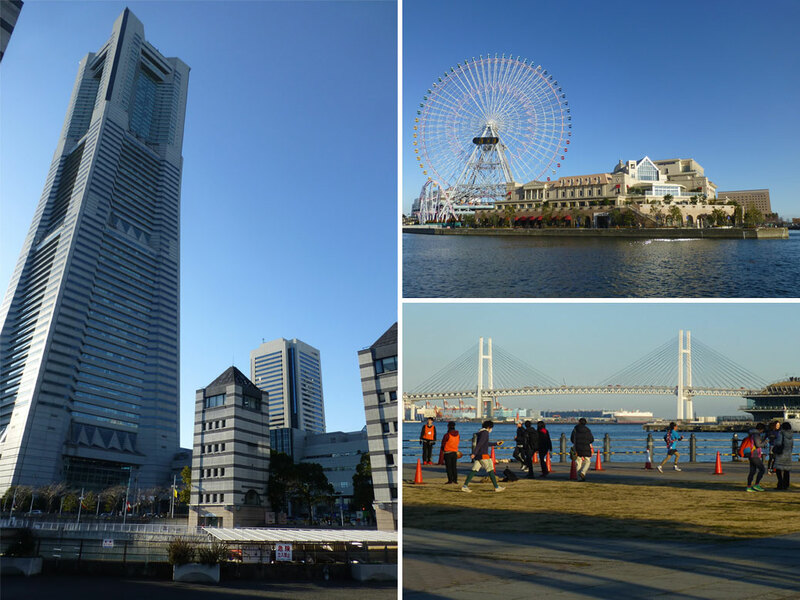 From MM21, we followed Kishamichi Promenade along the bayfront. It felt more like the Cairns Esplanade in Australia than anything we’ve seen in Japan. A running event was taking place on the day we visited, so we shuffled alongside those athletes braving the cold weather along the bayfront, ending up at the Red Brick Warehouse. The event overtook the grounds of the former customs warehouse, which was restored in the early 1990s and is now (of course) a retail center. 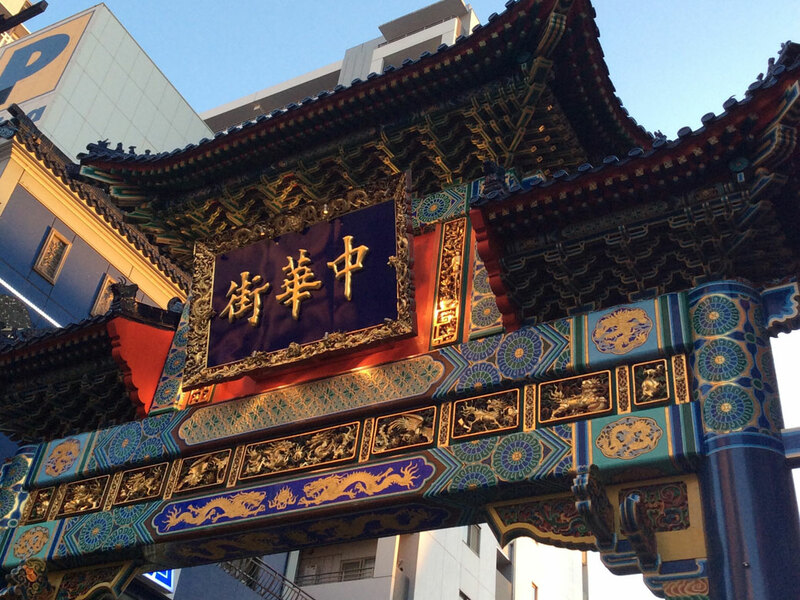 From there, we ventured inland toward Yokohama’s thriving Chinatown district. Thousands of Chinese immigrants arrived at the port in the 1800s, bringing with them food (including ramen) and customs that still thrive in Japan today. More than 250 shops are fit into several city blocks, making it one of the world’s largest “Chinatown” districts. 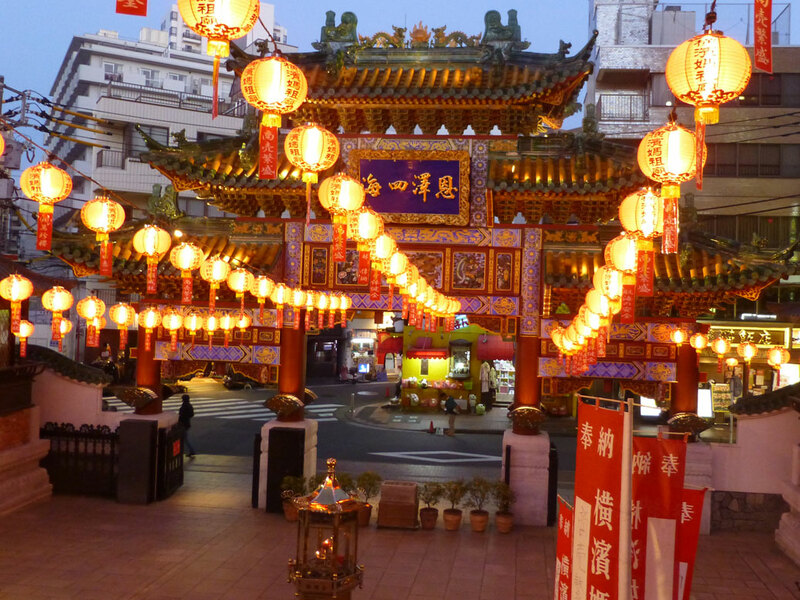 Two ornate and impressive temples appear between the pork bun shops in Chinatown. Guan Di Miao was founded in the 1860s by immigrants as a central spiritual site as well as a tribute to Guan Gong, a well-respected general during the Han Dynasty in around 220 B.C. The second temple rivals all of the great structures we’ve seen in Japan, yet was built less than a decade ago, officially opening in March 2006. The city had planned on building a large apartment complex on the site, but the community was concerned about the impact such a building would have on the area. They negotiated with the developers and eventually purchased the land, building Mazu Miao in its place. Less than two hours by train, Yokohama deserves another day trip in the near future. Would love to hear from anyone who’s visited about what we missed the first time around.